Thomas Spagnuolo, 53, was arrested on Tuesday, April 30, 2015, for the December 2014 death of Nancy Cafaro, police said. 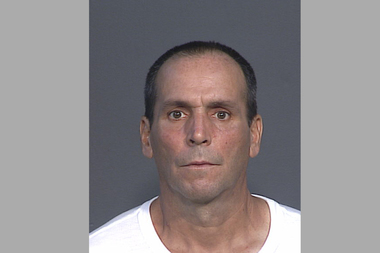 GRASMERE — A man was arrested for killing a Staten Island woman who was found dead inside her home in December, NYPD said. EMS workers found 55-year-old Nancy Cafaro dead in her 54 Lafayette Ave. home with head trauma. A baseball bat was discovered lying nearby on Dec. 8, 2014, police said. The workers were sent to her apartment after a family member or friend called police saying they were worried about her, police said. When no one answered her front door, they climbed into the kitchen window and found Carfaro on a bed in the living room, police said. Her death was ruled a homicide, police said. The suspect, 53-year-old Thomas Spagnuolo, was arrested Thursday after police found his DNA on the baseball bat found at the scene. He was charged with murder and criminal possession of a weapon, police said. According to court documents, Spagnuolo killed Cafaro by beating in the head numerous times with the baseball bat. Spagnuolo has been arrested numerous times — including several arrests for criminal possession of a controlled substance — and spent time in prison for manslaughter in 1990, according to police and the Department of Corrections. He also spent time in jail in 1981 for attempted robbery, according to the Department of Corrections. He was held without bail, and is due back in court on May 5, the District Attorney's office said.